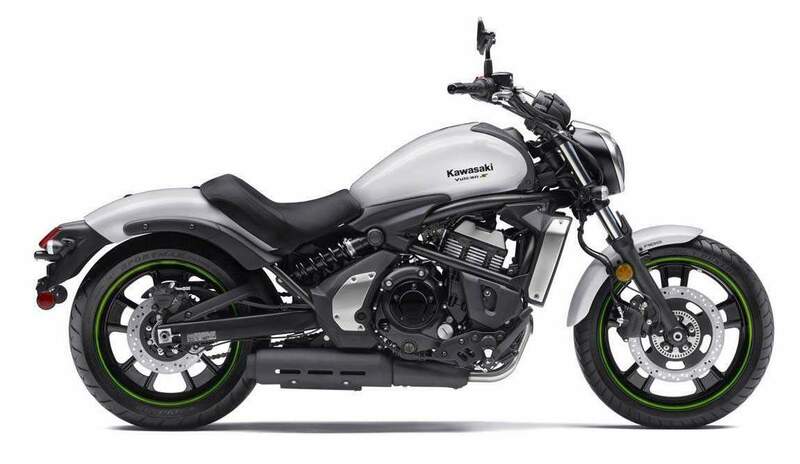 The Vulcan® S is a unique motorcycle that could only be a Kawasaki. 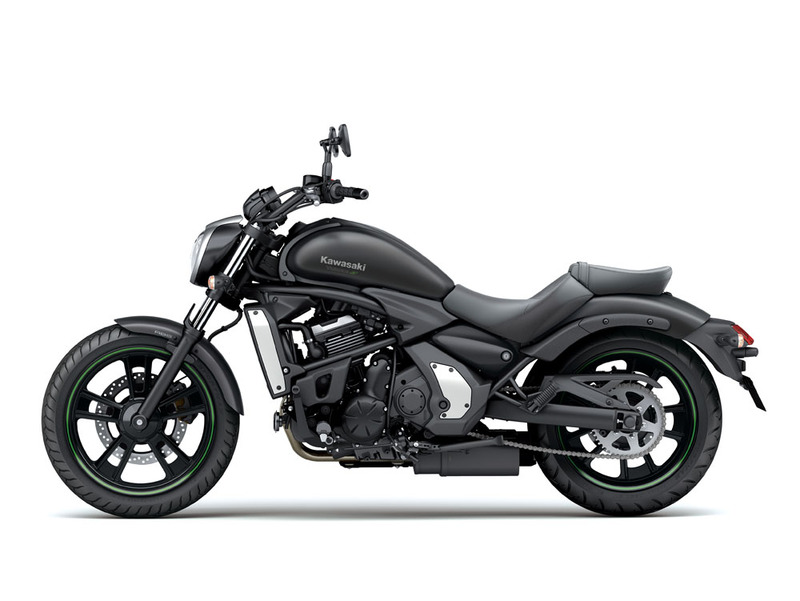 It combines the low silhouette of a Vulcan cruiser and mixes it with Kawasaki sportbike-derived power and handling, as well as a custom fit concept, designed to comfortably fit a wide range of riders. The result is a package that offers comfort, confidence and adjustability, which combine to provide a very special riding experience. The Vulcan S is the only motorcycle in its class with standard adjustable, forward-positioned footpegs, allowing a range of riders to get comfortable. It also has a low seat height, as well as optional seats and handlebar for the same reason. Furthermore, it boasts the lowest weight of any motorcycle in the category, and we all know what that means – easier to maneuver, quicker acceleration, easier to stop, quicker to turn and smooth suspension action. Another stand out element of the Vulcan S is its 649cc liquid-cooled parallel twin engine. Derived from the Kawasaki Ninja® 650 and tuned for more low- and mid-range torque, the engine is very smooth when pulling away from a traffic light and responsive when the rider wants to accelerate. This makes it suitable for novice riders, while its top-end power and nimble handling will keep more experienced riders entertained all day. There are many aspects that can influence the comfort and confidence of a motorcycle rider, and one of the most obvious is the fit. So, first and foremost, the Vulcan S has been designed to accommodate a wide range of riders. Being a cruiser-style motorcycle, the seat has a low height and is conveniently tapered at the front for greater comfort. This means most riders will be able to place their feet firmly on the ground, keeping them stable when stopped, and helping to increase confidence in stop-and-go city traffic. What’s more, there is significant hip support at the rear of the seat to increase the level of comfort. And there are tailored fit options with different seats and handlebar to ensure a comfortable fit for a range of riders. The Vulcan S has a slim chassis thanks to the narrow parallel twin engine, which has it engine cylinders positioned further forward than a conventional V-twin engine. The parallel twin configuration also enabled engineers to route the exhaust under the engine and away from the rider’s legs. A further benefit of the slim chassis is an increased lean angle when cornering. The Vulcan S suspension has been designed to absorb the bumps and give the rider feedback. Kawasaki Genuine Accessories has several options to tailor the motorcycle to fit individual riders. The optional Ergo-Fit™ reduced reach seat, for example, moves the hip support further forward, making it easier for riders with a shorter inseam to reach the adjustable footpegs and handlebar. There is also a second optional Ergo-Fit extended reach seat with firmer foam that moves the hip support further back to accommodate taller riders. For the rider who wants to take a friend along, the Vulcan S is even more customizable thanks to the optional Kawasaki Genuine Accessories passenger seat, backrest and passenger footpeg setup that will accommodate a second person. The rider’s forward-positioned footpegs are mounted in a relaxed position that is typical of the cruiser riding experience. As an industry first for this class of motorcycle, these footpegs have three positions to accommodate a variety of different-sized riders. With an adjustment range of 1” forward and 1” backwards from the mid mounting points, the footpegs will be able to suit shorter or taller riders for maximum confidence and comfort. Please note that Kawasaki Genuine Accessory Ergo-Fit shift rods are required when the footpegs are repositioned. It doesn’t stop there. 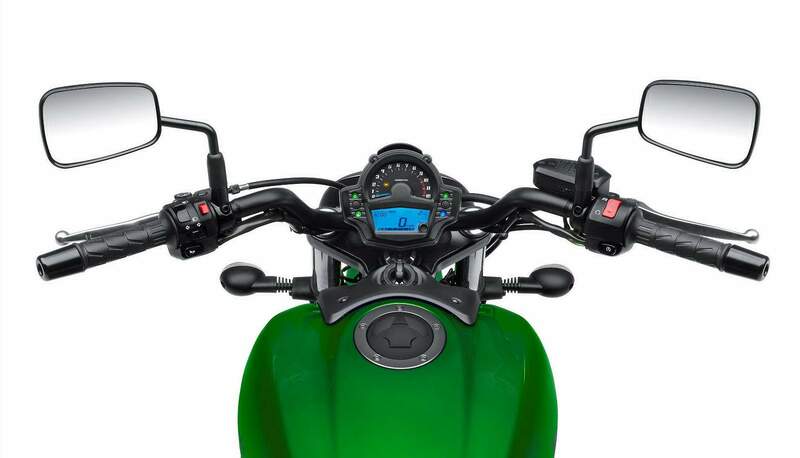 Kawasaki Genuine Accessories also offers an Ergo-Fit reduced reach handlebar to help riders with shorter arms to comfortably reach the bar, which is brought 1” closer to the rider. When combined with the low seat height, adjustable footpegs and range of accessory options, the Vulcan S ABS has been designed to instill confidence and increase the overall riding enjoyment, making it a good choice for novice and experienced riders alike. Continuing with the tailored fit theme of the Vulcan S, both the clutch and brake levers are adjustable for easy reach to suit a range of hand sizes. The rider will also appreciate the Positive Neutral Finder, which makes it easier to find neutral when stopped. The handlebar has a wide diameter for a positive feel and is rubber-mounted to reduce vibration and increase overall comfort. The instrumentation consists of a compact analog tachometer with a multifunction dual-window. The digital display features speed, fuel level, clock, odometer, dual trip meters, range, average and instant fuel economy as well as an Economical Riding Indicator to show when the rider is optimizing fuel economy. The liquid-cooled 649cc parallel twin engine is another important aspect of the Vulcan S. It brings many distinct advantages, which includes its Kawasaki sportbike DNA that enables superb flexibility at all engine speeds, a healthy power band and legendary dependability. It is also considerably smoother than the traditional V-twin engines used in most cruisers. The Vulcan S, the engine has been engineered specifically to make it cruiser-friendly and to inspire confidence in new riders, while still being fun and agile for experienced riders. There has been specific tuning to the camshaft profiles, intake funnel length, throttle body spacer and air intake to provide exceptional low- and mid-range power delivery. The aim was to create an engine with user-friendly characteristics that ensure the motorcycle is easy to ride, with a smooth power delivery that is responsive to rider inputs at low speed. It also has enough grunt at higher RPM to keep it entertaining, being considerably more powerful than most cruisers, without becoming intimidating. Thanks to its use of Digital Fuel Injection (DFI®) to carefully meter the fuel used by the 649cc engine, the Vulcan S will sip fuel, providing more miles and smiles between fuel stops while also being kinder to your wallet. The motorcycle boasts a 3.7-gallon fuel tank to give plenty of range between stops. The exhaust system has been routed under the engine to keep the motorcycle narrow for easy reach to the ground. It uses dual-wall pipe with a large diameter that is designed to look good and sound even better, having a distinctive growl that separates it from the typical cruiser. The six-speed transmission drives an O-ring chain to efficiently transfer engine power to the road. It also has a Kawasaki Positive Neutral Finder, that allows you to simply upshift from first when stopped to select neutral every time. With its cruiser appeal, the Vulcan S is long and low, with a wheelbase designed for increased stability at typical highway cruising speeds. And Kawasaki brought its sportbike expertise to create the slim, lightweight chassis that has a low center of gravity and centralized mass for even greater stability as well as nimble handling. These benefits will be felt as soon as you maneuver it out of the garage or in a tight space, but will be most appreciated on a Sunday morning ride. The new perimeter frame adds to the unique styling of the Vulcan S and incorporates a rear subframe with slim backbone that eliminates seat rails. By keeping the motorcycle narrow, it helps the rider’s feet reach the ground more easily. There is also a “D” section steel swingarm that provides both style and strength. The 31-degree rake and 7.1” trail of the front fork contribute to the light handling and easy control of the motorcycle, with the fork prioritized towards comfort and control. Similarly, the laydown, offset rear shock uses a back-link to provide a longer stroke for increased comfort. This setup also creates more space for the exhaust muffler. The suspension was designed to absorb bumps and provide plenty of feedback. In fact, it has 3.15” of rear wheel travel, which is more than most of its competitors and this contributes to the greater comfort. The rear shock also includes a seven-position, cam-style preload adjuster. It can be easily adjusted to suit the rider or when carrying a passenger and luggage, such as when the Kawasaki Genuine Accessories passenger components and luggage rack are fitted. 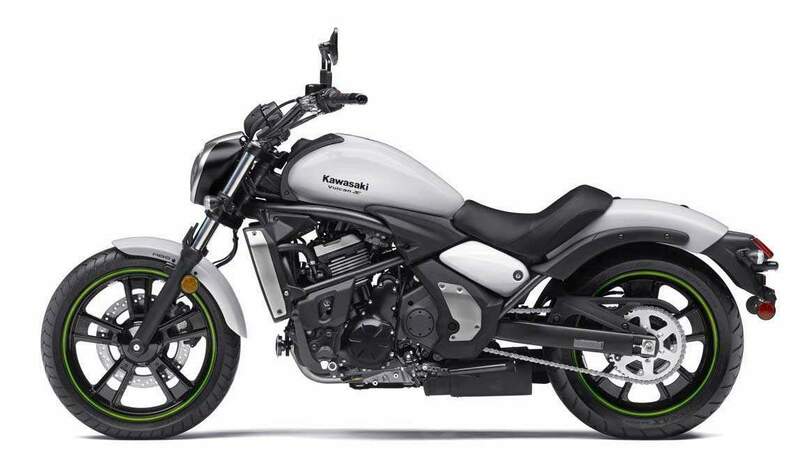 This means the 2105 Vulcan S rider will enjoy confidence thanks to its suspension technology that is neither rough nor fatiguing, as it can sometimes be on motorcycles with short-travel suspension. The Vulcan S is fitted with stylish cast wheels that feature a five-spoke design with twin spokes. These measure 18” front, 17” rear and exemplify cruiser style. The wheels are fitted with modern, high-performance radial tires to provide responsive handling. The brakes comprise a single 300mm rotor and twin-piston caliper up front, with a 250mm rotor mated to a single-piston rear caliper. The Vulcan S ABS model also adds anti-lock braking (ABS) technology, which adds to the rider confidence in the motorcycle’s stopping ability because it assists braking under certain conditions. As with any cruiser, style is very important, and the Vulcan S doesn’t disappoint. It incorporates elements such as the teardrop-shaped, 3.7-gallon fuel tank, inverted triangular headlight and black mirrors to match the black frame and exhaust muffler. The distinctive front headlight design works in conjunction with a bright and compact LED tail light. The rear light is incorporated into the rear fender, which is supported by the separate rear subframe. The Vulcan S will be available in three distinctive colors, including Candy Lime Green as well as Pearl Crystal White and Flat Ebony. 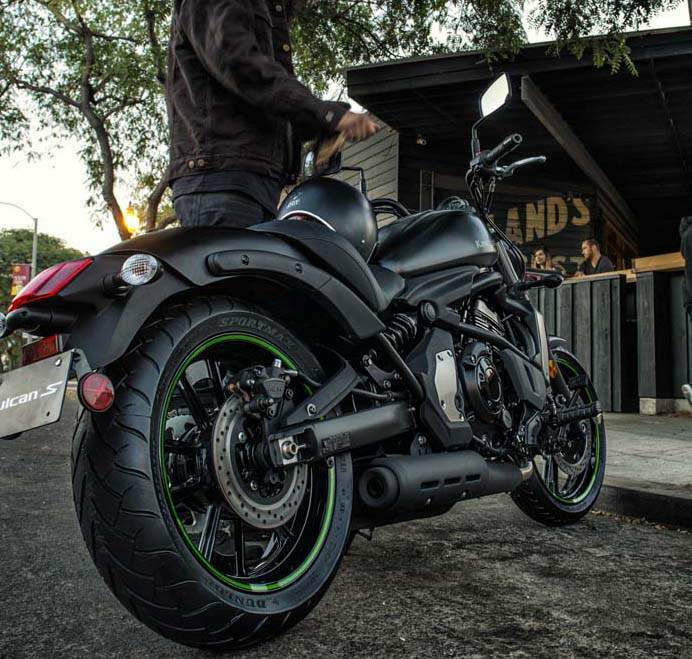 Kawasaki Genuine Accessories has developed a host of options to maximize the ownership experience of the Vulcan S. Owners can customize the fit, comfort and style of their motorcycle to meet their needs. Some of the standout items include Ergo-Fit™ seats and the Ergo-Fit reduced reach handlebar to tailor-fit the rider fit. Additionally, KQR™ (Kawasaki Quick Release) large and medium windshields, saddlebags and passenger backrest options allow for tool-less installation and removal of these classic cruiser accessories. Other notable accessories include a DC power outlet, gear position indicator, LED light bar and helmet lock. Kawasaki Genuine Accessories will have more than 25 parts available for purchase at your Kawasaki dealerships in early . With its unique blend of cruiser style and sportbike performance, as well as its customizable fit that instills greater confidence in the rider, there is only one thing left to do: Ride! 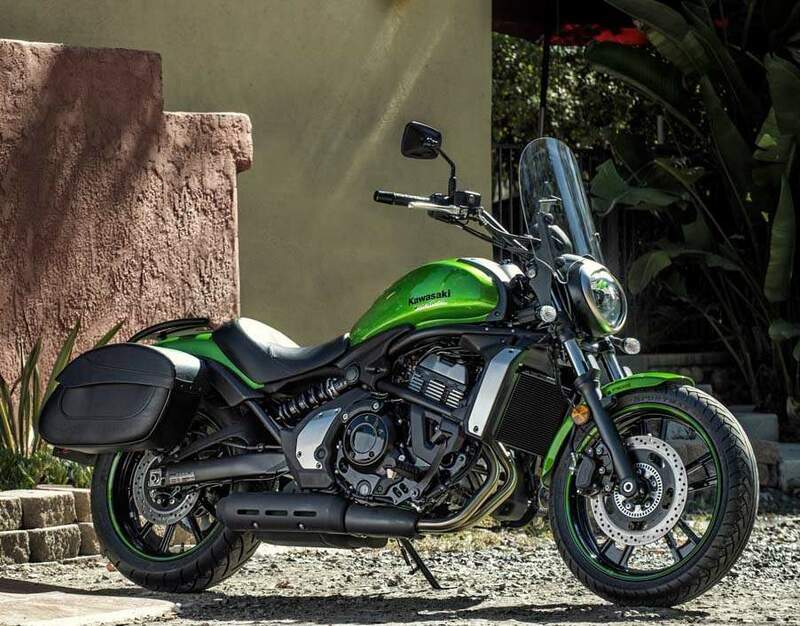 With its affordable purchase price, low running costs and easy parking, the Kawasaki Vulcan S is the perfect motorcycle for any rider to get across the city to meet friends. And while it has plenty of practical uses, the Vulcan S is fun, above anything else. It allows you to drop everything at a moment’s notice and take-off with a smile. 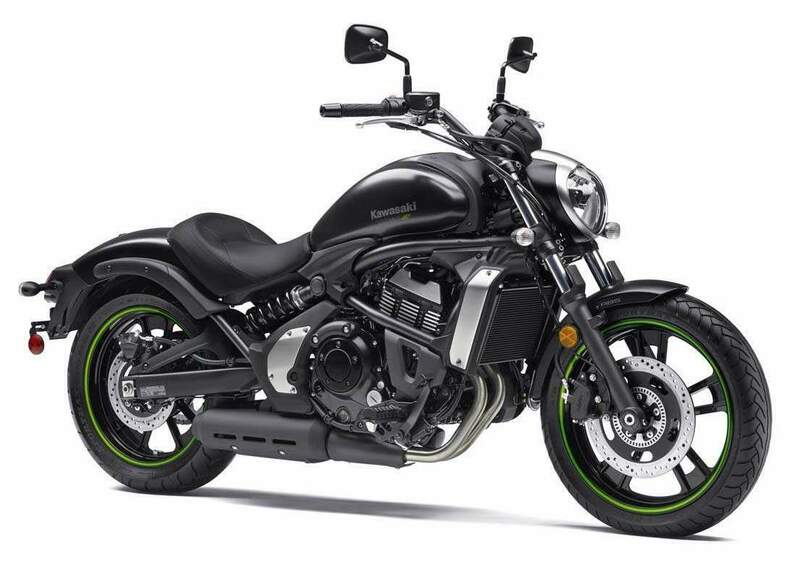 So whether you’re a new rider looking to buy a first motorcycle, or an experienced rider looking to rekindle the reason you started riding in the first place, the Vulcan S is the perfect reason to visit your local Kawasaki dealer.